Makimoto Sushi Auburn Hills review, pics, hours, and menu info – Makimoto is located on University Dr near the I-75 bridge in Auburn Hills in the Auburn Crossing shopping plaza. I went with a friend and battled the road construction just to get into the parking lot… and it was well worth it! Makimoto Sushi has just become a top player in my sushi tour. I would battle all kinds of traffic and construction to eat there any time! The sushi was fantastic and definitely some of the best I’ve ever had. Super fresh, great quality and quantity. When you look at everything you’re getting, it’s reasonably priced as far as sushi is concerned. The Makimoto staff was friendly, accommodating and incredibly knowledgeable. The entire experience was truly enjoyable and I can’t wait to go back. The number of sushi rolls in Makimoto’s menu is a very large selection. And, so many were incredibly unique. I totally appreciated the separate page in the menu that gave detailed descriptions of the specialty rolls. In the middle of their menu, Makimoto mentions “We’d like to take a moment to mention that our roll selection is rather great. We apologize for the lengthy reading below. We are working on an easy-view format.” But, in all honesty… leave it as it is!!! I appreciated it and was extremely helpful in making my selections. I ordered the Raider, Seaside and Spicy Shrimp rolls. The Raider roll had salmon, yellowtail, shrimp, avocado topped with tuna, salmon, avocado, and spicy sauce duo – probably my close favorite but too hard to say. The Seaside had tuna, cilantro, avocado, cucumber, jalapeno, topped with yellowtail, masago, lime juice, hot chili oil – totally a unique taste for sushi! And the Spicy Shrimp had cooked shrimp and some kind of delicious spicy layer. They were all so good, it’s hard to think about ordering anything else, but at the same time, it’s hard not to with the large selection of tempting sushi at Makimoto. Makimoto offers Nigiri Sushi, Traditional Rolls (single ingredient), Special Rolls, and Specialty Topping Rolls (like the Raider and Seaside). Makimoto Sushi Auburn Hills also offers Japanese entrees on its menu such as Teriyaki and Hibachi dishes, Tempura dinners, Bibim-Bop, and more. This is only place that I’ve ever received complimentary miso soup and cucumber salad with my sushi order. I really appreciated that as well. And, I know I’m not the only one recognizing the great quality at Makimoto… they’ve got five star ratings all over the place. 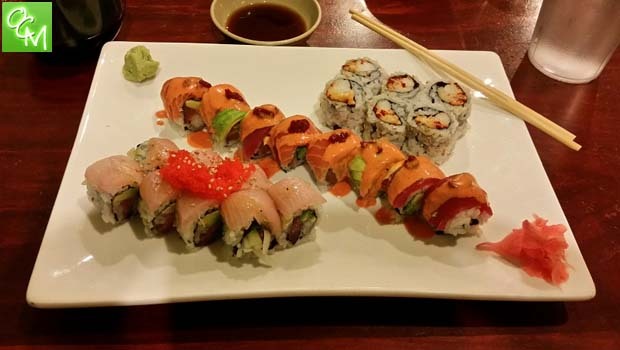 See related articles and posts below for more Oakland County MI Sushi Restaurants or our REVIEWS/RESTAURANTS tab for more Oakland County and Metro Detroit MI restaurant reviews, pics and more. Do Baby Milestones Determine A Child’s Success?